Founded in 1926, Hans Wilsdorf, the founder of Rolex, took over the Tudor brand in 1936 to offer his retailers an alternative, more affordable range of watches. Tudor has become a rising star in recent years, delivering a competitive package of style, Swiss watchmaking know-how, and exceptional value. Popular collections today include the Black Bay, Pelagos, North Flag, Glamour, Fastrider Black Shield, and Heritage Chrono. 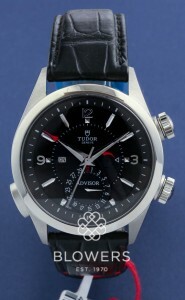 Browse Blowers’ selection of pre-owned Tudor watches below. All our watches come with a one-year guarantee for your peace of mind. 0% finance available. Our watches can be viewed at our Kingston upon Hull boutique or our London office in Mayfair.